WR Mohamed Sanu vs. CB Darryl Roberts – Atlanta Falcons’ wide receiver Mohamed Sanu poses a potential matchup advantage this weekend against the New York Jets. Sanu currently ranks 14th in yards per route run from the slot out of 57 qualified receivers. He will likely be matched up with either cornerback Darryl Roberts. CB Buster Skrine is the usual starter but will miss this game due to injury. Roberts will fill in, which could be an issue for the Jets. Roberts has struggled a bit while in the slot, and he has by allowed a 118.8 passer rating when lined up in the slot. 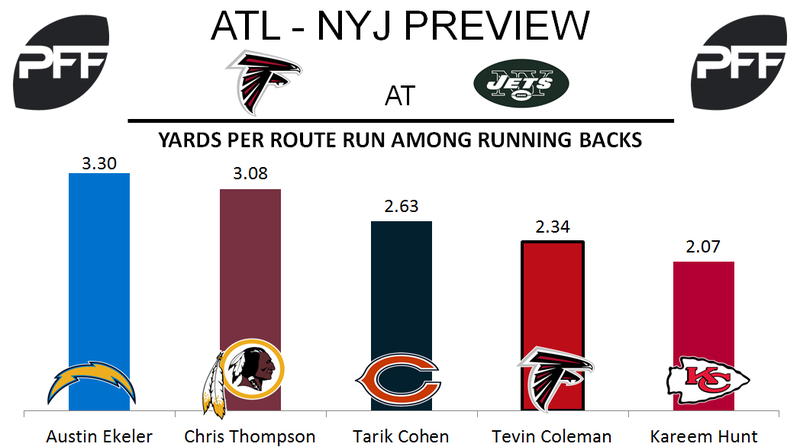 RB Tevin Coleman vs. LB Demario Davis – Halfback Tevin Coleman is one of the better receiving halfbacks in the NFL and he will be matched up with an excellent coverage linebacker in Demario Davis. Coleman currently ranks fourth among 37 qualified halfbacks in yards per route run with a mark of 2.34 YPRR. 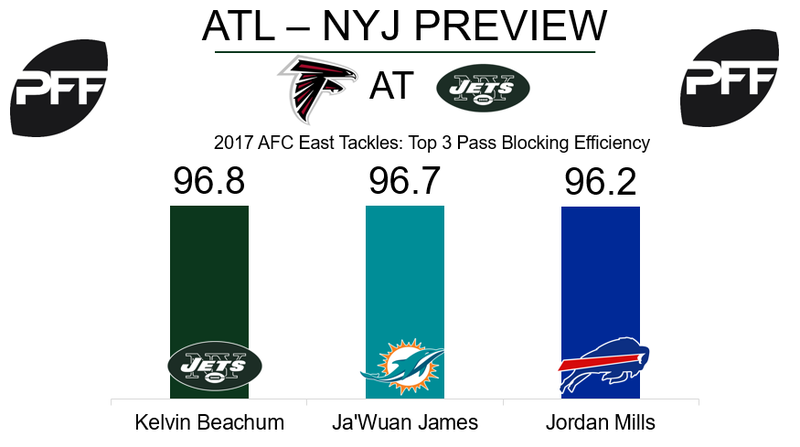 The Jets will rely on Davis to slow down Coleman’s receiving prowess and so far this season, Davis has been solid in coverage. Davis currently ranks 13th out of 74 qualified linebackers in yards per route run allowed giving up a rate of just 0.74 YPRR. T Jake Matthews vs. Edge Kony Ealy – Ealy came to New York late in the preseason and has been a pleasant surprise so far in 2017. Ealy has provided a boost in pass-rushing situations, as he currently ranks 27th out of 106 in overall grade among qualified edge defenders with a grade of 81.7. Now in his fourth season, Ealy has rushed on near two-thirds of his pass-rushing snaps from the defense’s right side, meaning he will going up mostly against left tackle Jake Matthews. Matthews is coming off a solid game in Week 7 as he earned his highest single-game passing-blocking grade of the season by earning a pass blocking grade of 81.8. WR Jermaine Kearse vs. CB Robert Alford – Kearse has had a solid first season with the Jets, currently ranking 12th out of 83 qualified receivers with a wide receiver rating of 119.7 (the passer rating the quarterback has when targeting him). He will have an opportunity to continue this good start against Robert Alford, who has struggled mightily for the Falcons. His overall grade of 53.3 ranks 80th out of 112 qualified cornerbacks, and has allowed 307 yards in coverage, the 19th most out of 111 cornerbacks. It will be interesting to see show this matchup plays out. G Brian Winters vs. DI Grady Jarrett – Winters will have to deal with the 18th highest graded interior defender in Grady Jarrett, and that matchup definitely favors Atlanta. Winters’ overall grade this season is a mediocre 44.1, which ranks 56th out of 78 qualified offensive guards. Last week against Miami, Winters allowed a team high five hurries in only 32 pass-blocking snaps. Handling Jarrett is not an easy task, so how Winters does in this matchup will go a long way towards deciding who wins this game. T Kelvin Beachum vs. Edge Vic Beasley – After leading the league in sacks last season, Beasley has struggled this year. He hasn’t played enough snaps to qualify, but if he did, his overall grade of 50.3 would rank 89th out of 106 edge defenders. He will look to get it going against Kelvin Beachum, who has been the best Jets offensive lineman this year. Beachum’s overall grade of 78.7 is currently 18th out of 74 qualified offensive tackles, and his pass-blocking grade of 81.6 is eighth.